This is a season of gratitude and crap. Gratitude because our hockey team, the Nashville Predators just won the Division Championship. Crap because our hockey team, blah-blah-blah, just won the Division Championship and now we’re in the playoffs. Gratitude because we’re in the playoffs. Crap because we’re in the play-offs which reminds me of our son going to play-off games with us in 2017 and celebrating his favorite player, Victor Arviddson. Chris had also started acting odd. Odd like getting lost, leaving games early, not showing up on time to go to games and other abnormal behaviors like losing jobs. The play-off year of 2018 was worse. In January Chris was diagnosed with a very rare brain disease: adult onset leukodystophy with axonal spheroids and pigmented glia. Gratitude for 911, EMS, ER’s, PhD’s, MD’s, RN’s, LPN’s, PT’s, Family, Friends, Neighbors, Strangers and God’s presence entwined in our Hell. Crap because they were all needed. Gratitude for the diversion in the spring of 2018 when the Predators got into the playoffs again. Chris stayed home with Gretchen and the home caregiver that would come while we were at the games. He needed help eating and walking, but he sat and watched the Predators with his sister and his caregiver – falling asleep many times in the recliner. I’m coming to the conclusion that everything in our personal lives, focuses on our children. No matter how old they get, they’re still our children. I’d gotten to the age where I would joke that our kids, Chris and Gretchen, were now older than me. Terry has always been an old soul. Me, not so much, although I feel like my soul has aged decades in less than a year. Gratitude for our daughter who was such a hero to him and to us. She is very devoted to her brother and they loved each other dearly. My heart will never heal from their sorrows. Crap because I’m writing about loss again. It’s almost a year since our son Chris died. Time flies, and then again, it stands still. Gratitude. I got words down. Crap. I got words down. A neighbor gifted me a book on grief. It’s been a Godsend. 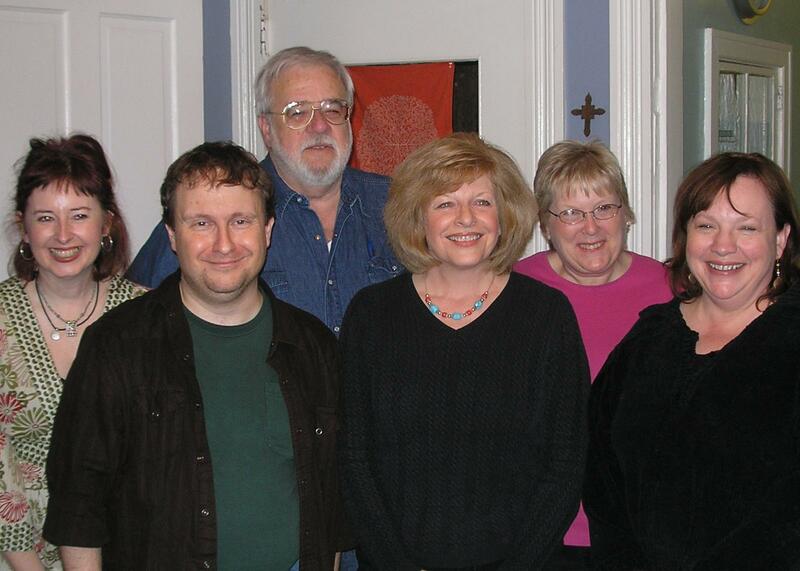 this pic is from the writer’s workshop given by Darnell Arnoult for the Council for the Written Word. darnell’s workshop was wonderful. she inspires you think, write and look forward to a positive experience from the effort. her first novel, sufficient grace, was the only book i finished in 2007. like many other readers, i start books and put them aside if they don’t grab me. this one, got me by the throat and wouldn’t put me down. i was on the decorating and food committee for this workshop and i ran with the idea of recreating the novel. the book is full of wonderful words for your senses. food is a very important part of the story, so we had homemade baked goods. 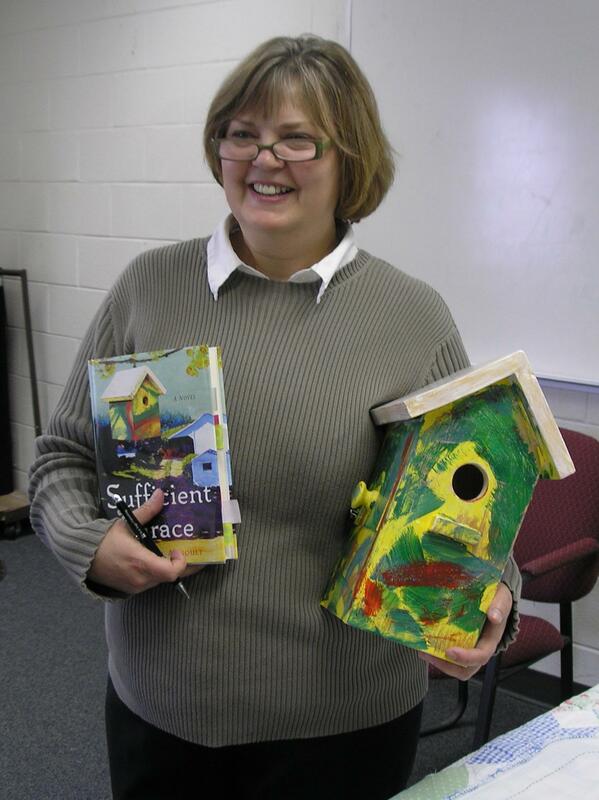 mama toot paints birdhouses like the one depicted on the front cover of the book. i decided to incorporate that into the decorating theme, too. my husband built two bluebird houses and i painted them to look similar to the house on the cover of the novel. we gave one as a doorprize to a man from west virginia and presented the other to darnell. she was thrilled. 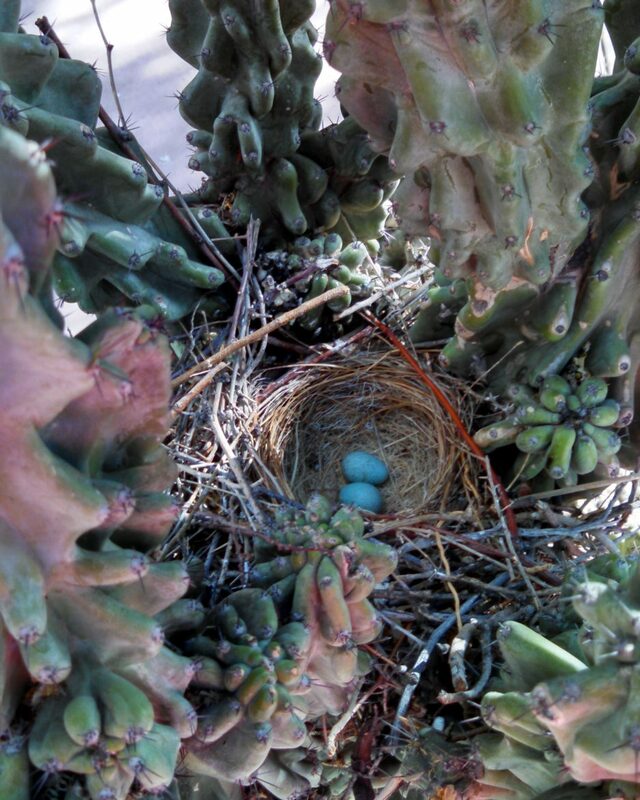 the birdhouses are sturdy and have a opening to retrieve nests that have been abandoned or reposessed. simple flowers in simple vases were on the food tables, desk at the front of the room and registration table. i used an old ketchup bottle for three stems. those tables were all layered either in quilts with linens or old tablecloths with handmade linens with embroidery. it was like walking into gramma’s country cottage. 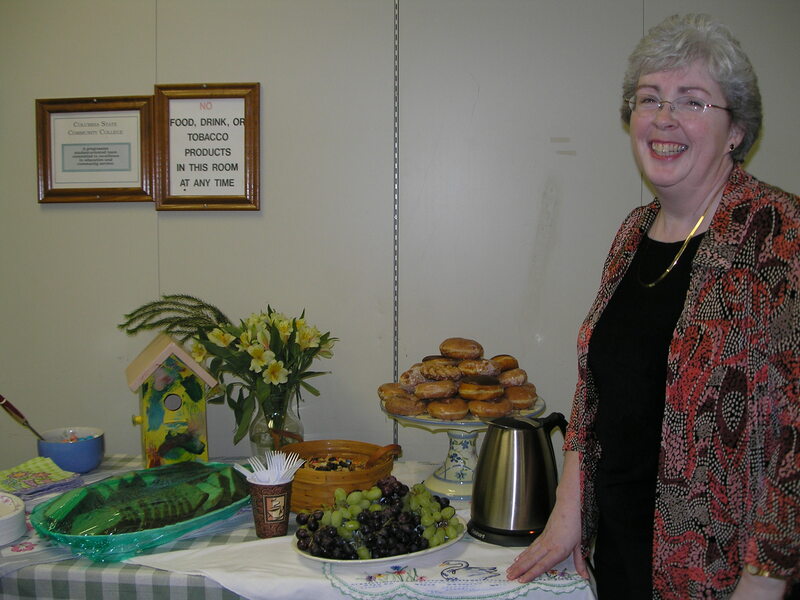 this is angela, the donut lady, who helped me at the CWW Spring Writer’s Workshop a few weeks ago. angela and colleen helped me decorate and shop for breakfast treats. coffee, tea, grapes, donuts and homemade pound cakes were enjoyed before and during the morning workshop given by darnell arnoult. what does that sign say??? most of my day today was spent doing critiques for my writer’s group, CAPS. we’ve been together for, gosh, i think it’s over five years, now. we’d lost and added members and are at a comfortable six, with two guys added to balance out all the estrogen in the group. tonight is meeting night. we meet the first and third tuesday of the month. our schedule on who submits is very, very, very flexible. whoever is ready and gets their piece posted first, second or third gets critiqued. most of the time we’re working with one or two pieces. today we had four! which is very exciting because that means everyone is kicking into high gear to get their writing off to a great and super start at the beginning of the year. i’ve been using this blog to write and get myself jump-started. i got myself into a writer’s funk this past fall and needed something fresh to get me going again. this has worked as i’ve been trying to post as often as possible to get my creative juices flowing once again. my writer friends are bloggers, creative nonfiction writers, short story writers, novelists, poets and songwriters. talk about an eclectic mix! they’re good, too. todays work was fascinating and enjoyable to read. i’m so lucky to be involved in this wonderful group of creative people – friends. i hope everyone who is writing is as lucky as i am and is involved in a writer’s group. please use the tab at the top of the page to read past columns. hope you enjoy.